The Pre-Raphaelite Brotherhood (PRB), founded by John Everett Millais, William Holman Hunt and Dante Gabriel Rossetti was an artistic group that responded to modernity in England, especially the rapid urbanisation of suburbs and outskirts in 1850’s London. The PRP was original in that their works were not light-hearted or anecdotal compared to other subjects at exhibitions. Many artists portrayed contemporary life in the countryside where the effect of industrialization was less dramatic and impactful. In July 1852 Ford Madox Brown stayed in Hampstead Heath, and three of his works which took several years to produce; An English Autumn Afternoon, The Last of England, and Work were begun over the next few months. To me, Work is an allegorical image of the organisation of labour in modern England. At this time there were sanitary improvements being constructed in the city; which was a major concern at the time. It demonstrates modernity’s effect on the psychical and social environments. The Last of England one of Ford Maddox Brown’s most well-known works (1852-1855) was a comment on the increasing population of Britain. Brown insisted this painting was a history painting; seen as a campaign to persuade the excess population to move to the under-populated imperial territories. The oval shape of the painting has the aesthetic form of Renaissance paintings, whom the PRB greatly admired. It reminds me of the Holy Family Scenes, or the Virgin and Child paintings and frescoes. Hogarth (the predecessor of modern-life-subjects) is another artist I greatly admire and Brown offers a similar satirical view, a grouping of grotesque figures can be seen in the background. A caricatured figure can be seen shaking his fist at the White Cliffs of Dover, his figure as a result of drinking too much consequently does not deserve forgiveness. Ford Maddox Brown, The Last of England, 1852-1855, oil on oval panel, Birmingham Museum and Art Gallery. © Wikimedia Commons, the free media repository. 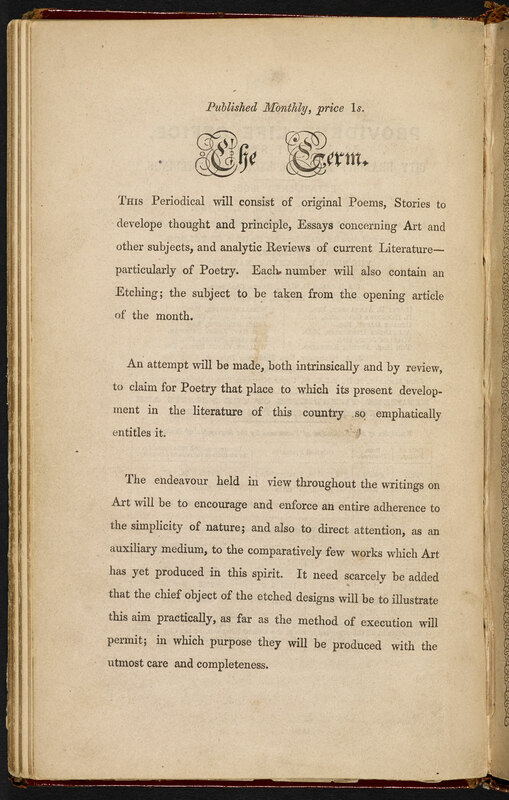 With a view to obtain the thoughts of Artists, upon Nature as evolved in Art […] this Periodical has been established. Thus, then, it is not open to the conflicting opinions of all who handle the brush and palette, nor is it restricted to actual practitioners; but is intended to enunciate the principles of those who, in the true spirit of Art, enforce a rigid adherence to the simplicity of Nature either in Art or Poetry […]. 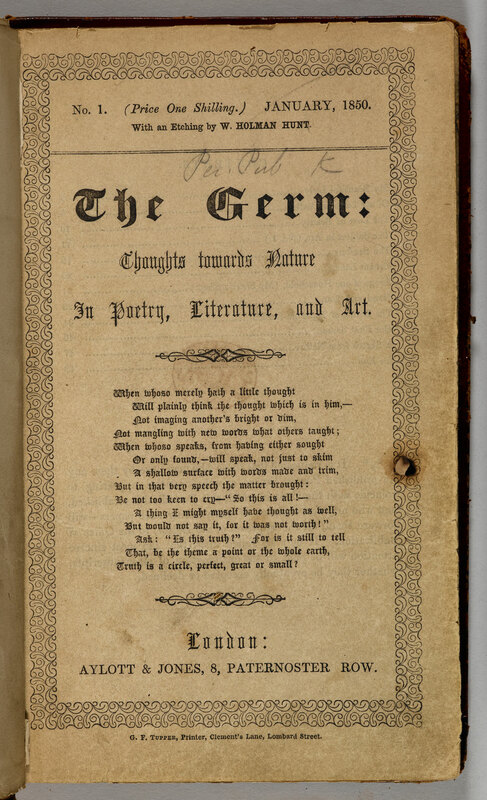 The Germ: Thoughts Towards Nature in Poetry, Literature, and Art. P – Jan 1850, London. © Public Domain. I love the words in the third paragraph, “enforce an adherence to the simplicity of nature,” which encapsulate every aspect in the paintings produced by the PRB. They are so detailed and beautiful yet not idealized, idyllic, or “pretty”. To me, Brown is the artists whose works from the PRB were and are the most impactful in terms of painting modern life. His new aesthetic has an unapologetic and visual scrutiny of social realities and their effects on all classes of people, but especially the poor. The location of the PRB’s body of work was mainly formed in South East London. The locations are very close to my heart, and there is so much to see and learn in Kent. Yet the county is often overlooked compared to the bohemian and bourgeois Sussex, or central London. The Red House, created by William Morris is just 2 minutes down the road from my childhood home, in Bexleyheath. Morris was drawn to the idyllic Medievalist style and portrayal of rural life that featured in the PRB’s work. Morris bought their artwork which was costly. Edward Burne-Jones shared Morris’ interest, he became an apprentice to Dante Gabriel Rossetti; the three soon became close friends. Through Rossetti, Morris met the poet Robert Browning, and the artists Arthur Hughes, Thomas Woolner, and PRB co-founder Ford Madox Brown. Morris abandoned his architectural apprenticeship, and Rossetti persuaded him to take up painting instead, which he chose to do in the Pre-Raphaelite style. You can see why their paintings were rejected. They were very radical, and their stance on what art “should be,” could have, and did, shake up and affect the rigid accepted standards in high art. I always admire creatives who are outspoken. This is how new paths are forged and our future becomes brighter and more exciting. Who are your favourite PRB members, or do you dislike their work altogether?